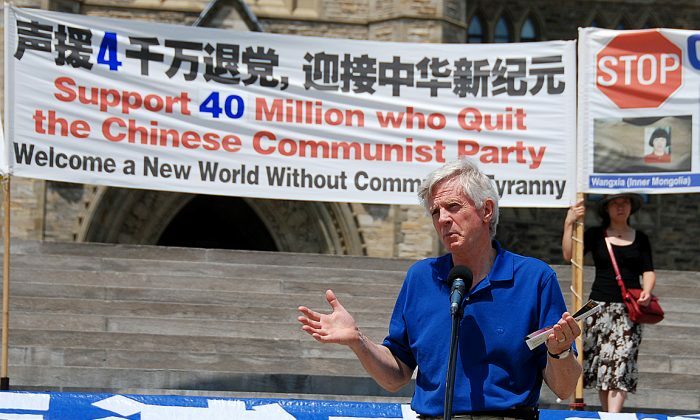 OTTAWA—As resignations from the Chinese Communist Party (CCP) nears 40 million, supporters in Ottawa held a rally on Parliament Hill on July 12 to celebrate this milestone in the approach to the end of communism in China. “Forty million have resigned from the CCP, and that is 40 million steps in a better direction,” said David Kilgour, former Canadian Secretary of State for Asia-Pacific. “If everybody would resign from the CCP, think what a better world this would be. It would give the people of China the opportunity to elect their own leaders, elect people who are honest, who believe that government of, by, and for the people—democracy—is the best form of government,” he said. Pam McLennan, host of the rally, noted that the event also supported the goal of obtaining one million signatures on a petition asking the U.N. and Prime Minister Stephen Harper to demand that China stop persecuting, torturing, and killing Falun Gong practitioners in China. 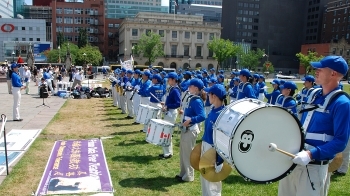 The Coalition to Investigate the Persecution of Falun Gong (CIPFG), which initiated the petition, plans to present the petition to the U.N., the International Olympics Committee, and various governments and human rights organizations worldwide at the end of July, just prior to the start of the Beijing Olympics in August. CIPFG was formed shortly after news broke in 2006 that the Chinese communist regime was harvesting vital organs from imprisoned Falun Gong practitioners, said Ms. McLennan. The Epoch Times first broke the story on March 9, 2006 when it published an interview with a journalist who claimed to have knowledge of this practice after having worked in Shenyang City. On the request of the CIPFG, Mr. Kilgour and Winnipeg-based international human rights lawyer David Matas conducted their own independent investigation. They released a report in July 2006 confirming that large-scale organ seizures from Falun Gong practitioners have been taking place in China since the persecution of Falun Gong began in 1999. Since 2006 the two have travelled to 45 countries to conduct research and publicize their findings. In January 2007 they published “Bloody Harvest,” an updated report documenting new evidence. The Kilgour-Matas report also speaks of the state-sponsored hate campaign that accompanies the persecution. “The Falun Gong in China are dehumanized both in word and deed … This incitement to hatred is most acute in China. But it exists worldwide,” said the report. The most recent example occurred in New York City’s Flushing Chinatown. Outside the Flushing Library on May 17, a mob of hundreds swarmed a small group of volunteers at a service centre set up to allow Chinese people to withdraw from the CCP. The booth is staffed predominantly by Falun Gong practitioners. 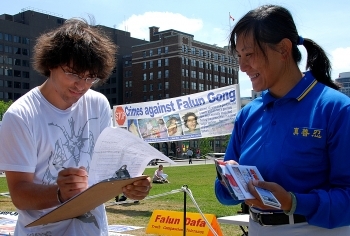 Since then, pro-CCP Chinese have continued to physically and verbally assault Falun Gong practitioners as they tend their booth and distribute literature documenting the CCP’s human rights abuses. The Epoch Times obtained a recorded conversation in May in which Consul General Peng Keyu boasted about encouraging the attacks. “They came over after they fought with Falun Gong and I shook hands with them one by one and thanked them,” Mr. Peng is recorded saying. The individuals carrying out the attacks could potentially go to jail if charged and convicted, said Mr. Matas. And if they are non-U.S. citizens but only have temporary status in the U.S., then if convicted they could lose their status and face expulsion. Ms. McLennan said that every day tens of thousands of people in China publicly withdraw from the CCP and its affiliated associations on a website created for that purpose. Many decided to withdraw after reading the Nine Commentaries on the Communist Party, an editorial series first published in the Chinese-language Epoch Times newspaper in 2004. “The book reveals the true nature of the CCP as it traces the bloody history of the party in China and its net negative effect on China’s people, culture, rights, and daily lives,” said Ms. McLennan. The mass movement to withdraw from the CCP “is gaining momentum and changing China quickly in a quiet and peaceful way,” she said. In fact, since the assaults in Flushing began in May, more than 100 new service centres have been established worldwide to help Chinese people withdraw from the CCP. In 2005 the Nine Commentaries won the Asian American Journalists Association Award for Asian American Issues-Online.